"Blue/Indigo Puppies On Their 5th Run In Harness @ 8 Months Old!" " Indigo & Blues Puppies At 6 Months!" "Hobbits First Run @12 Months Of Age, 10/05/2013!" 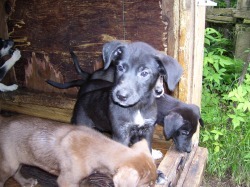 "Tanya & Frodos Puppies At Six Weeks Of Age!" 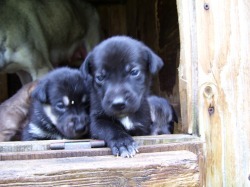 "Frodo & Tanya's Puppies First Steps @ 11 Days Of Age! 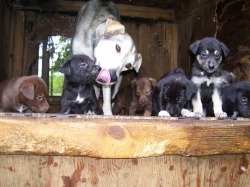 "Tanya & Her Puppies 07/28/2013!" 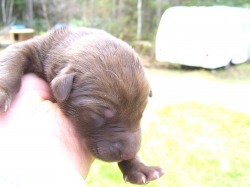 "Early Arrivals.Frodo & Tanya's Puppies Born 07/28/2013!" 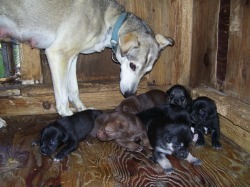 Between 1am & 3.30 am, Tanya gave birth to 5 beautiful, healthy puppies ( 2 males & 3 females). It was a bit of a surprise as the puppies weren't due until the 30th. Frodo' breeding is Indy/Belle & Tanya's breeding is Tony/?. "Frodo & Tanya's Puppies Due 07/30/2013!" The Hobbits: Merry, Sam, Frodo & Pippin First Hook Up 5/14/2013! "Yaluk & Tepeu enjoying their new home in the kennel,05/09/2013!" "Yaluk & Tepeu: Playtime 04/14/2013"
" BELLE & INDY'S PUPPIES @ 7 Months!" "ANGEL & WILLY'S PUPPIES @ 11 WEEKS OLD!" "BELLA & INDY'S PUPPIES ON 2/14/2013!" "PUPPIES BORN 1/05/2013,1 MALE & 1 FEMALE"
"Puppies @ 15 Weeks Of Age!" "PUPPIES AT 10 WEEKS OF AGE!" "PUPPIES HAVE ARRIVED AT THEIR NEW HOME! "Bella's & Indy's Puppies @ 5 Weeks"
"Bella & Indy's Puppies 19 Days Old!" " Bella & Indy's Puppies @ 10 Days!" 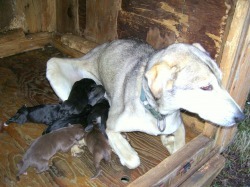 Indy & Bella's puppies were born on September 22, 2012. Three Females & Two Males. This is a breeding from Laurent Gonsolin that I will be purchasing four of the puppies. 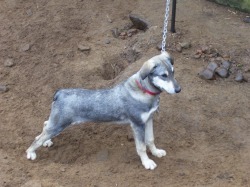 Due to no puppies from the Tony/Teal breeding, Laurent was kind enough to make me an offer with this breeding. Bella is the sister of Blue & Indy is Laurent's leader. 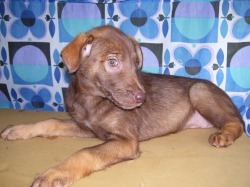 I will update the pedigrees when I pickup the puppies. Merci Laurent for your kindness. "Everything Is Ready For the Teal/Tony Puppies!" UPDATE: NO PUPPIES! Everything, that is if Teal is pregnant. She really is not showing any real physical signs. The due date is the 9th of June, so I placed her in the new whelping pen to adjust before delivery. 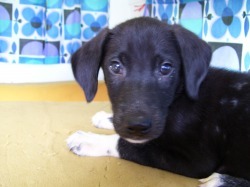 "Halona Showing Off For The Camera, 2/15/2012!" "Hinto & Hok'ee Getting Adjusted To Life In The Kennel!" 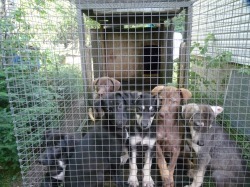 "Hinto, Hok'ee, Hurit & Halona-First Time Out Of The Whelping Box 10/08 2011!" "PUPPIES AFTER BREAKFAST - 12 WEEKS OF AGE!" "FAMILY PORTRAIT AT 9 WEEKS OF AGE!" " I KNOW I AM BEAUTIFUL!" "FAMILY PORTRAIT @ 7 WEEKS OLD!" "PUPPIES AT 6 WEEKS OF AGE"
" EATING CAN BE MESSY!" "HAVE TO CHECK THIS OUT! YUMMY!" "PLAY TIME, JULY 11th, 2011!" LEARNING TO WALK, OPENING EYES AND EATING=EXHAUSTION! "DOG DAYS OF SUMMER, JULY 5th, 2011"
"FIVE DAYS OLD & GROWING QUICKLY!" "FIVE MALES & THREE FEMALES BORN 6/25/2011"
" FIFTEEN DAYS TO GO! " THE PUPPIES ARE ONE YEAR OLD! "PUPPIES GETTING READY FOR THEIR FIRST RUN!" Here is Annie howling with delight before her first run while Katie looks on. 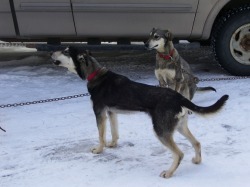 The pups are now 9 months old and getting ready to go to school and learn to be sled dogs. 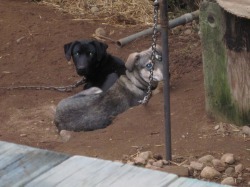 Before they are run, the pups are picketed out on the drop chains by the truck. Vicky has decided to renovate her house to have a side view. This not exactly what I wanted! The pups are all doing great and growing. They are getting quite big and showing real muscle development. They getting more active and will soon be introduced to the harness and then the first hookup. It should be fun!!!! "POISED & READY TO GO!" Katie looks like she is ready to take off on a run. 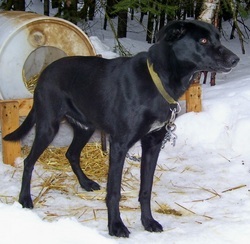 Although she is sporting a new red collar, she is missing the harness & sled. It is interesting to see now the mussel developement and the physical conformation taking place with the pups as they are getting older. A big change from a 6 short months ago. All the pups have grown out of their puppy collars and are now wearing their adult ones.
" NICKY & KATIE RELAXING AFTER A VIGOROUS PLAY TIME !" The pups are all growing at a steady pace, eating more and playing harder. They love the interaction when they get visitors. Nicky, Willy and Sophie have already grown out of the puppy collars and are now sporting their adult ones.
" PLAY TIME IN OUR NEW AREA! " The new kennel offers the pups the opportunity to interact with each and to keep the bonding they had in the Whelping Pen. Here, they were caught on film playing with each other. They are all well adjusted to the new set up and their food intake has increased to facilitate the additional exercise. "IT IS AWAYS GREAT TO HAVE A BEST FRIEND!" 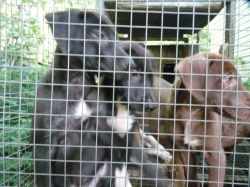 This photo was taken on the first day in the Kennel and shows the companionship of Annie & Lizzy. The pups have been in their new area for three days now and have settled in fine. They are just like the adults now and enjoy playing with each other. "FIRST DAY OUT OF THE PUPPY PEN!" As seen here in this photo, Lizzy is not to sure of the new setting while Katie looks on and Willy tries to comfort her. 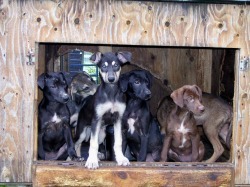 Leaving the confines of the whelping pen and missing the comfort of huddling together with their litter mates can be traumatic for some of the pups. However, they quickly adjust to the their new life. It is very important for me to spend more quality time with them as they go through this adjustment. They quickly learn they can get one on one time with me. It is also fun for me to get an even closer bond with each of the pups and observe their individual personalities.
" FOUR MONTHS OLD AND THEY ARE GETTING BIGGER!" Willy is getting his first taste of life outside the whelping pen. 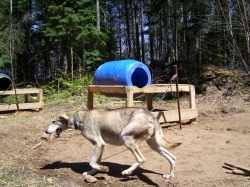 He is one of the most active dogs in the pen, but outside all he did was lay down and rip up the vegetation. He was not afraid of the goings on, he was just cautious. He did enjoy getting my undivided attention. This week, I will try to get all the pups out for exposure and get them ready to enter the kennel with the adults in early October.
" NO THE FOOD DISH IS NOT GETTING SMALLER, THE PUPS ARE GETTING BIGGER!" The pups are now three months old and they are growing, it seems, daily. They have increased their food intake by a third in the last week. When they are eating is the only time to take a photo to catch them standing still. Their activity levels have increased and they really enjoy their play time. Katie is definitely the instigator of the group and loves to create a commotion. She likes to wait until all her litter mates are enjoying a group sleep and then she jumps in the middle of the group waking them all up. "LOOK MY EARS ARE STARTING TO STAND UP!" Annie's ears are starting to stand up, but they are really having to work at it. The other pups are questionable if their ears will stand up or be more like their fathers. "GROUP PHOTO AFTER EATING BREAKFAST!" Willy, Sophie and Nicky are posing for the camera while Lizzy, Annie and Katie finish the food as Vicky looks on. 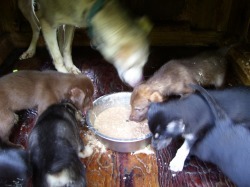 The food tray is getting bigger and the pups clean up all the food in just minutes after serving. Sophie is still wearing some of her breakfast on her nose. Soon Willy will clean that food off. Something caught Sophie,Willy & Vickie's attention. The pups are growing like weeds, everyday they seem to be getting bigger. Their appetite is also growing at an accelerated pace to keep up with their growth. This week they were introduced to baited water ( approximately a half hour after they eat ) and it has become an instant hit! 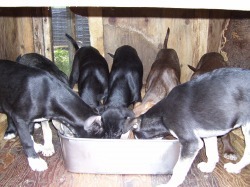 It is very easy to introduce timely drinking to the dogs when they are young and in a group setting. No one whats the other to get something more than them. 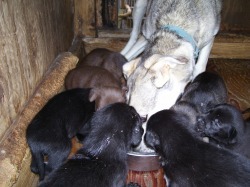 It is important to teach the pups to drink quickly when water is offered, as it will quickly freeze in the Winter. It is also very important to get them used to drinking, when fluids are offered, to keep them hydrated when training/racing. "FAMILY PORTRAIT AT 10 WEEKS"
The family portrait was missing one pup! Nicky was too sleepy, after eating, to come out of the house for the group photo. The photo was taken after the evening meal. The pups are growing quickly and getting very active during their play times. They are eating more & more every day to aid in supporting their increased activity and growth. On Thursday , Vicky & Lizzy decided to join in when the adults were having the morning group sing-a-long. It was really funny to see with them sitting,their heads cocked back howling to the best of their ability. The pups have had a lot of visitors this last couple of weeks and are enjoying the added attention. "WITH THESE EARS, I WONDER IF I COULD FLY?" Sophie looks like she is wondering about flight. While Vicky, Willy are contemplating jumping and Katie(seen under Sophie's ear) is just taking in the view. In the background, Annie is trying to dismantle some of the plywood wall. "SO YOU SAVED THE BEST FOR LAST!" Sophie is a little miffed that she was the last to have her photo taken. Sophie is very intelligent and likes her independence. She enjoys exploring by herself and has very little fear of new experiences. When I use the hose to water clean the pen , she loves to run through the water as it is being sprayed. She loves attention and is a real treat to play with. "HERE IS LOOKING AT YOU!" Willy has no problem looking at the camera for his photo, just doesn't care! 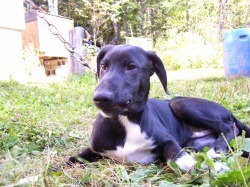 Willy is a very active pup, likes to play and eat. He responds to his name when called and enjoys the attention he gets from me. He seems to be a dog that loves to please. Potential leader?
" LIZZY IS NOT THE ONLY ONE THAT CAN STRIKE A POSE. HOW IS THIS?" Annie couldn't be out done by her sister for the photo shoot. 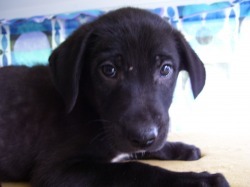 Annie is a little sweetheart, a little shy with humans. 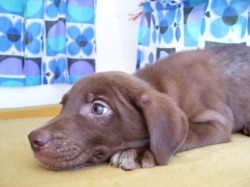 But, she is usually in the middle of any group play with her litter mates. 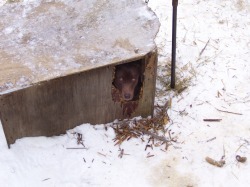 Annie comes to me now, when the rest of the pups swarm me, when I open the door to the whelping box.
" HOW IS THAT FOR STRIKING A POSE!" Lizzy seems to enjoy having her photo taken. She is so far the most photogenic of the pups. I hope she doesn't strike a pose every time she sees a camera when racing! Lizzy was a little shy at the beginning compared to some of her litter mates, but now she is one of the first to come running for my attention. "SAY CHEESE! OKAY, JUST LOOK AT THE CAMERA!" Nicky is showing real enthusiasm for his 8 Wk profile. Nicky is the largest of the pups and also the quietest. 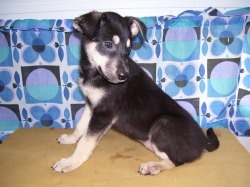 He is very easy to get along with and likes joining into playing with his litter mates. He is always the first into the food and the last to leave. He has a real sweet personality. He seems to be the most like his father, Blackie. Only 4 more pups to introduce over the next 4 days. "NO! I WONT LOOK AT THE CAMERA!" Katie was the quietest I have seen her to take her 8 week profile. Katie is the most adventurous and the most outgoing of all the pups. She is a real fun pup. Vicky is showing real enthusiasm for the photo session. I believe she would rather be back with her litter mates playing. The pups are now 8 weeks old. How time flies! There is nothing so good as a group nap in the great outdoors after eating and a group play time. Yes, all seven pups are in the photo. "FAMILY PORTRAIT AT 7 WEEKS"
Family portrait- (from left to right) Katie (laying down), Lizzy, Annie, Sophie, Nicky, Vicky and Willy. All the pups are doing well on their own now and are far more active. Their food consumption is also increasing with being more active and their growing cycles. Many are already starting to respond to their names and the individual personalities are now becoming more pronounced. "WE CAN SEE THE LAKE FROM HERE!" The puppies are all doing great after the worming, good appetites and far more active. 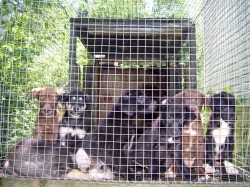 They are now enjoying playing in the pen as well as in the whelping box. 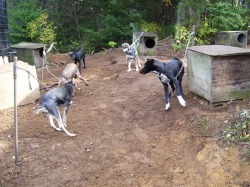 It is funny to hear them thumping away in the box and then run out and play in the pen. 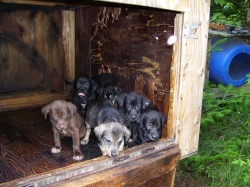 They have quickly learned to do their business out in the pen and not leave a mess in the whelping box. With the wire mesh all the waist falls right through to the ground keeping the pen clean and leaving a healthy environment for the pups to live in. It is a lot of fun now playing with the pups. They all come running to me when I call " PUPPY- PUPPY!" Cannelle has adjusted to life back in the kennel and she gets extra attention from me every day to show my appreciation. 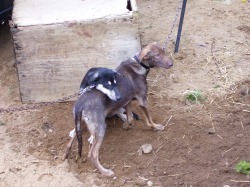 Today Cannelle was removed from her puppies,if all goes well, she will not be returned to the Whelping Pen. Cannelle has been removed daily for 5 days now and returned for the evening. She seems happy to be back in the kennel and now has more freedom to run. The pups have been eating solids for a couple of weeks now and Cannelle has not been nursing lately. As you can see from the photo one is missing. Lizzy was to busy exploring to take time for the family 6 week photo. With the removal of Cannelle, all the pups and Cannelle were wormed for the first time and this will be repeated in 10 days. 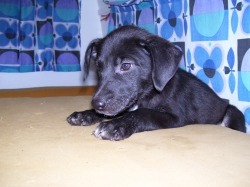 Normally all puppies have Round Worms and require the worming procedure. "DIVING INTO THEIR FEED AT 5 WEEKS OLD"
They are not getting any neater when they dive into their breakfast. Cannelle is kept very busy cleaning her brood and also the whelping den after the pups eat. In less than an hour after eating Cannelle has everything cleaned up and back to normal. Normally after feeding they all take a nap. All the pups are growing rather equally and getting more active as they move around the whelping box and playing with each other. It is also very difficult to get photo without someone moving. Out of 18 photos taken only 7 were any good. "FAMILY PORTRAIT AT 4 WEEKS OF AGE"
It is not easy to get a family portrait getting everyone in the photo and not moving. The group from left to right: Vicky,Nicky,Cannelle,Lizzy,Willy,Ann,Katie and Sophie. Photo was taken right after their morning meal and you can see Cannelle cleaning up Nicky. All the pups require a good cleaning by Cannelle after eating. "WHAT IS EVERYBODY LOOKING AT?" The pups are all deciding to take a look at the world outside the whelping box. Here Nicky & Ann take a look while Katie hides in the background. 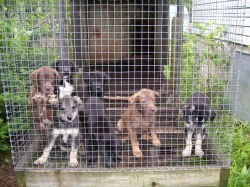 Due too the proliferation of Back Flies, I am playing with the puppies later at night. It is funny, as I approach the puppy pen the adults in the kennel start barking signifying my arrival. 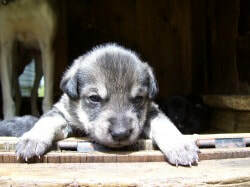 I can here the puppies waking up and running to the door of the pen to greet me. They are really fun to play with! With the coming of maturity, at 3 weeks of age, comes the responsibility to contemplate the future! As Willy seems to examines the great world outside his domain you wounder what he is thinking. The pups progression seems very rapid after just three weeks. They are now playing together, walking ,exploring, eating some solid food and developing quickly ( physically & mentally ). They are all sporting nice new teeth. Mom is not going to enjoy this development. Best to teach them to eat solids. The food dish is now a busy place and Mom has to be in a hurry to get her share! It is hard to believe that at three weeks old these guys are already learning to eat solids. The puppies just opened their eyes, started to walk only a couple of days ago, now have teeth and are showing their competitive nature for eating solid food. If this is any indication, they are going to be quick learners. Soon, I will have to give them a little dish of their own and feed Mom in a different place. After eating, Mom has a big job cleaning up the puppies with food all over them. It is sure a big world out there. Right now I am glad I am in here protected by mother and accompanied by my brothers and sisters. "WHAT IS IN THE DISH?" 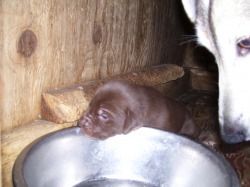 One of the pups is checking out her mothers food dish, as Cannelle looks on. This is no accident as it is the second day in a row for this inspection. 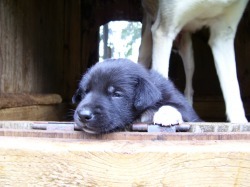 As soon as their eyes open, the puppies get far more inquisitive and start exploring.
" A MOTHERS PRIDE "
Cannelle is seen here inspecting her more active litter. 1,2,3,4,5,6, wait, where is the 7th puppie? Oh, he is behind me exploring the whelping pen. The eyes are all open now and the puppies are far more mobile, curious about their surroundings and their fellow puppies. Their little muzzles are more pronounced now and you can now observe more individual personalities in their face. It is really enjoyable to see them experimenting with their new found mobility and interaction with their siblings. COMFORT IN HANGING WITH MY BROTHERS AND SISTERS! As you can see from the photo, the puppies enjoy relaxing together nestled up next to their mother after having a good feed. They enjoy the warmth and comfort of numbers. They are getting more active and yesterday two of them had opened their eyes. As they get to see, their little world will start to expand and they will start their exploration of life. 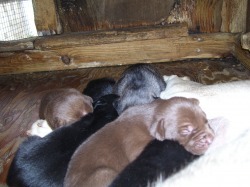 Today the puppies are one week old and they have at least doubled in size. 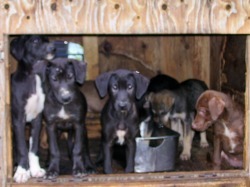 They are becoming more active and moving around in the whelping box. They are not walking, more like swimming. But, that is not slowing them down. They are still eating like little pigs and then they veg. as they are so full. Their eyes are not open yet, but soon. This little girl is totally relaxed and placid. They can be real active in the pen, but when they are picked up they become real placid and relaxed. Cannelle is a great mother and loves to have her puppies nestled around here. TODAYS ACTIVITY: EAT & SLEEP! Busy time for Mom, puppies just want to eat & sleep. Soon they will be adding moving around into the activity.All the puppies and Mom are doing real good. They are just over 2 days old and you can already see a difference in their strength as they push their way into the desired feeding station. Nobody is being pushed out of feeding. But where did the the " brown ones" come from? Last night between 10.30pm & 11.30pm, Cannelle gave birth to 5 females & 2 males. All puppies and their mother are doing well. This photo was taken with the puppies being only 8 hours old. Stay tunned for more updates. CANNELLE is less than a week away from her due date for the birth of her puppies and she is getting big. 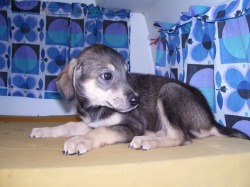 On Saturday, she was moved into the whelping pen to awaite the delivery. Puppies are due around the 21st of May.